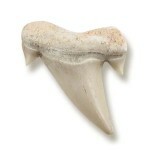 A shark tooth is one of the numerous teeth of a shark. Sharks continually shed their teeth, and some Carcharhiniformes shed approximately 35,000 teeth in a lifetime. 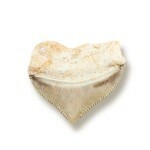 In some geological formations, shark’s teeth are a common fossil. These fossils can be analyzed for information on shark evolution and biology, especially because the teeth are often the only part of the shark to be fossilized, in fact fossil teeth comprise much of the fossil record of the Elasmobranchii, extending back hundreds of millions of years. The most ancient types of sharks date back to 450 million years ago, during the Late Ordovician period, and they are mostly known from their fossilised teeth. 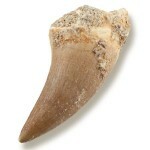 The most commonly found fossil shark’s teeth are, however, from the Cenozoic (the last 65 million years). The oldest known records of fossilized shark teeth are by Pliny the Elder who believed that these triangular objects fell from the sky during lunar eclipses. According to Renaissance accounts, large, triangular fossil teeth often found embedded in rocky formations were believed to be petrified tongues of dragons and snakes and so were referred to as “tongue stones” or “glossopetrae”, Glossopetrae were commonly thought to be a remedy or cure for various poisons and toxins. They were used in the treatment of snake bites. Due to this ingrained belief, many noblemen and royalty wore these “tongue stones” pendants or kept them in their pockets as good-luck charms. This interpretation was corrected in 1611 by the Italian naturalist Fabio Colonna, who recognized them as ancient shark teeth, and, in 1667, by the Danish naturalist Nicolaus Steno, who discussed their composition and famously produced a depiction of a shark’s head bearing such teeth. He mentioned his findings in a book, The Head of a Shark Dissected, which also contained an illustration of a C. megalodon tooth, previously considered to be a tongue stone.